The ECMA RAND promise covering .Net, is about as trustworthy as Ballmer himself (define “Reasonable”), and has already been broken anyway, with the exclusive “protection” afforded to Novell in their pact with Microsoft. IOW the RAND “promise” is neither reasonable nor non-discriminatory. It is nothing more than a farce, and coming from liars like those at Microsoft (“Red Hat customers owe us money”), isn’t worth the paper it’s written on. GNU/Linux has software that “clones” proprietary technology from other companies too, so why should I be so obsessed with the encumbered technology coming from just one company, Microsoft? It is simply because none of those other companies operate an illegal global monopoly, are guilty of anti-trust crimes on at least two continents, or behave like thugs and gangsters by spreading FUD about GNU/Linux (“Linux is a cancer”); sabotaging charities like the OLPC; and bribing Nigerian officials to dump Mandriva for Windows. Their corruption over OOXML is also well documented, bribing Swedish voters with promises of “market subsidies” in exchange for votes. Microsoft’s Mafia-like behaviour is extremely well documented (it fills several pages at Groklaw), indeed they seem quite proud of it. 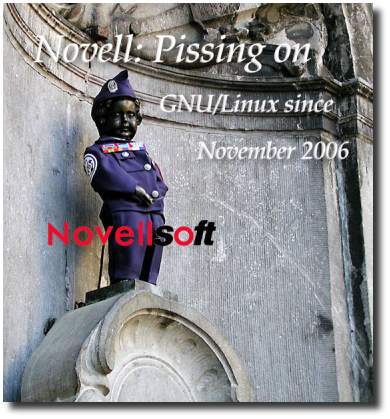 In general, most other software companies (Patent Trolls aside, many of whom are just Microsoft shell companies) have no desire to destroy GNU/Linux, so even though they may have encumbered software that is “cloned” by GNU/Linux (e.g. Adobe Flash), I am not especially concerned about it. My one and only concern is Microsoft, one of the most vile and reprehensible corporations in history. They are a threat to everyone, even their own partners (e.g. the PlaysForSure fiasco). Voluntarily using Microsoft’s encumbered technology is suicide, and extremely damaging to Free Software, since it indirectly promotes Microsoft’s vicious agenda. I just wish I could persuade Mono programmers of that fact, since they are so preoccupied with the technical issues, that they seem to be completely oblivious to the political ones. They (and you) may not have an agenda, but Microsoft does, and you can be sure that they mean to execute it. Like it or not, by using and promoting Mono, you are helping them. Quite frankly, the disgusting picture at the bottom drew my attention completely away from the article. I kept on thinking ‘what kind of sick little puppy comes up with such crude imagery?’ and hence I completely didn’t bother to read anything you wrote. You are eet, aren’t you?